Our UHD Banner line is made using a premium glossy scrim vinyl. Scrim vinyl uses a polyethylene substrate reinforced with a strong polyester corded mesh. This internal mesh gives each banner strength and durability, allowing it to resist strong winds and weather. The smooth polyethylene surface creates a solid face and absorbs our UV inks evenly. The protective coating we apply to the final printed image creates a UV resistant, waterproof finish that can survive outdoors for up to 2 years. Our banners have heat welded seams to prevent fraying and corner wear. We also provide the option to include pole pockets, grommets at any interval, and nylon paracord along either axis. Our 13oz UHD Banners are equivalent to the industry standard. When you see a a municipal light pole banner, temporary signage for a building, or a sponsor banner at a ballpark, most likely you are looking at a 13oz Scrim Vinyl Banner. 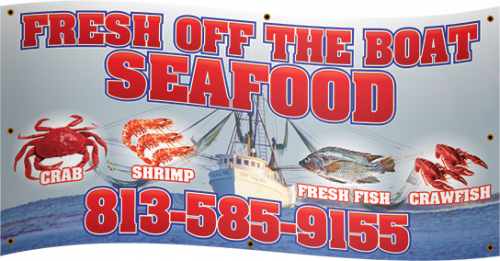 This is our most popular option and is comparable to most other affordable banner products. What sets us apart is the finishing details such as heat welding, included grommets and options like pole pockets and paracord. If you are looking to get a more durable, resilient or longer lasting banner, our 15oz and 18oz options are a great way to maximize your longevity without having to replace the entire banner. When to choose a 15oz or 18oz. Vinyl banners that you intend to use for trade shows, regular events or multiple locations would benefit from heavier material. These banners are going to be more forgiving of the constant folding and shuffling that you’ll be doing moving them from location to location. Any time you plan on moving the banner, especially if it will spent time in the elements you’ll want a heavier material. As the material ages, specifically in the sun and rain, it can become brittle. This usually is only an issue after six months to a year in the elements. Banners primarily used indoors but moved often will be more pliable and supple but can begin to show wear and tear all the same.